Apple just issued a press release confirming a conference call scheduled for tomorrow, March 19th, to announce the outcome of discussions concerning the company's cash balance. Tim Cook, Apple’s CEO, and Peter Oppenheimer, Apple’s CFO, will host a conference call to announce the outcome of the Company’s discussions concerning its cash balance. Apple® will not be providing an update on the current quarter nor will any topics be discussed other than cash. Apple will provide a live stream of the conference call on its website starting at 6 AM PDT (9 AM EDT). As noted in the press release, Apple won't discuss any other details related to the ongoing quarter -- as such, we shouldn't expect any sales numbers related to the release of the new iPad during the conference call. Apple, whose stock is currently trading at $585, has been rumored for years to be on the verge of announcing a dividend for its shareholders. In the past years, however, both CFO Oppenheimer as well as Tim Cook himself reiterated several times that Apple's cash wasn't "burning a hole in their pocket" -- the company may have avoided discussions of a dividend, but as Tim Cook also recently noted, they haven't been religious about holding or not holding cash. In the past year alone, Apple bought Israeli chip maker Anobit and App Store search and indexing service Chomp. Similarly, it was previously reported that $3.9 billion of Apple's cash reserves may have gone into securing deals for LCD displays and other components in 2011. We know if we need to acquire something -- a piece of the puzzle to make something big and bold -- we can write a check for it and not borrow a lot of money and put our whole company at risk,” Jobs said today at Apple’s shareholder meeting. “The cash in the bank gives us tremendous security and flexibility. To date we’ve wanted to have flexibility…. The cash isn’t burning a hole in our pockets and we’re not going to do silly things with it. We invest it conservatively….We’ve taken money and done things in Apple’s best interests, for example we’ve acquired several companies, some IP, we’ve invested in the supply chain and we use money to build out our stores and for new product tooling. So I believe what we’re doing with cash …that said, I’m not religious about holding cash or not holding it, I’m religious about of a lot of things, but that’s not one of them. We do what we believe is in Apple’s best interests …and we’ll continue to discuss it on the Apple board. With just under $98 billion in cash and liquid investments ($97.6 billion in cash at end of December, compared to $81.6 billion at end of September with an increase in $16 billion), in February 2012 at the Goldman Sachs Technology Conference Cook said Apple has been "judicious" and "deliberate" with its cash. 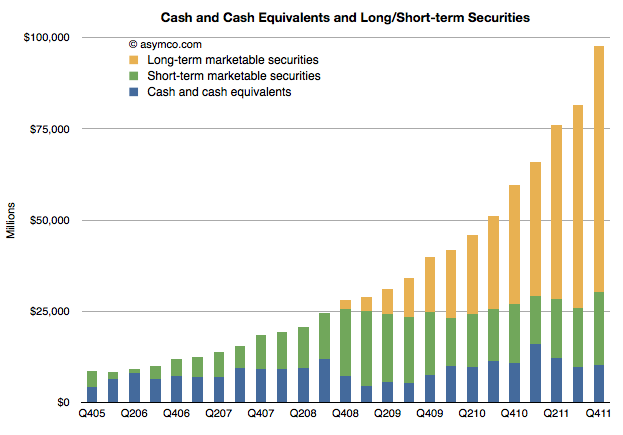 Via Asymco, an image showing the composition and scale of Apple's cash holdings. As Philip Elmer-DeWitt noted in February, there are some options Apple could consider with its cash. These options analysts and journalists have suggested include a one-time dividend, a stock split, a share repurchase plan, and an annual dividend. While there haven't been any signs of the company effectively considering said options with for its cash holdings, Tim Cook publicly stated they were only asking "for a bit of patience" to make the "best decision for the shareholders". He also went on the record saying Apple has "more cash than we need to run the business on a daily basis". We will post details of Apple's announcement starting at 9 AM EDT tomorrow on MacStories' homepage.